1 of 5 Place turkey breast half in slow cooker insert. Season with salt and pepper. Pour broth around turkey; add bay leaf, thyme and oregano. Cover and cook on HIGH for 5 hours or on LOW for 7 hours. 2 of 5 Using a large spatula, carefully remove turkey from slow cooker to a cutting board. Remove and discard bones; strain broth from slow cooker into a bowl. 3 of 5 Place mashed potato granules in a medium bowl. Ladle 1 1/2 cups of the strained broth over granules. Whisk to blend, then cover and set aside. 4 of 5 Meanwhile, combine gravy mix and 1 cup cold water in small saucepan. Bring to a simmer; cook 1 minute. 5 of 5 Cut turkey crosswise into slices. Place 1 piece of bread on a plate. 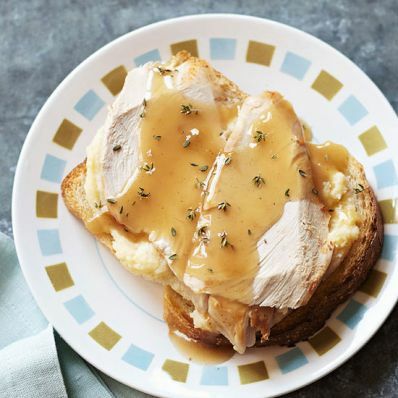 Spread with 1/3 cup mashed potatoes and some of the turkey, and top with a little gravy. Repeat to make 6 sandwiches and serve. Per Serving: 419 kcal cal., 761 mg sodium, 2 g fiber, 1 g sat. fat, 140 mg chol., 3 g Fat, total, 37 g carb., 56 g pro.